Capital of the Gironès and of the homonymous province, Girona (1) is located between four rivers: the Ter, the Onyar, the Güell and the Galligants; it can be reached by road, rail or via its airport (2). The economic centre of the province, Girona is one of the most important cities of Catalonia and one of the most active in the cultural and business fields (3). From the urban attraction of Girona through to charming rural villages this region has something for everyone: fairs and traditional festivals, adventure sports, local cuisine using local produce… and a territory rich in culture and scenery. 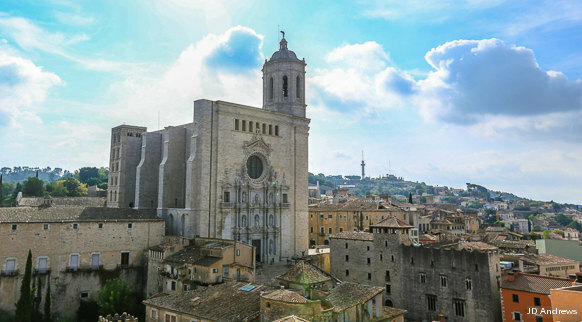 The capital of the Gironès is one of the richest in medieval heritage in Catalonia: the cathedral, the Arabian Baths or the Jewish Quarter, which is one of the most important in Europe. A stroll along the banks of the Onyar, the Rambla or through La Devesa Park are unmissable, as are the Museum of Cinema and the Museum of History. What is a city like through the eyes of a child? Girona has created an unprecedented guide which allows it to get close to the young ones: you can find cultural and entertainment proposals, curiosities, legends, pastimes… and even gastronomic offers! Few cities worldwide can say that at home they have the best restaurant in the world (El Celler de Can Roca), as well as others with Michelin Stars, in addition to the best traditional cuisine using the best fresh produce. In addition, the Girona Gastronomic Week promotes local cuisine and that of the regions of the Gironès, with tastings to suit all tastes and every budget.